In the past, they used to apply chemical fertilizers and pesticides in their farm. They were promised by the agent of the chemical company a double in their harvest/ production using synthetic and chemical fertilizers. In doing so, they encountered infestation problem in the farm such as “army worm” in the rice fields. This resulted to very low production as their loans got bigger and bigger which they can hardly pay. With this experience, they decided to try organic farming as an alternative. The shift from inorganic to organic is not easy, besides organic farming is labour intensive. The other farmers were saying that they are out of their minds or “baliw” since they cannot ever pay their outstanding loans. However, in spite of this, the family continued implementing organic farming. When they implemented various sustainable organic agriculture technologies like rice-fish farming, planting of fruit trees, various vegetable in their farm, they decided not to hire labour or involved their neighbours to show that they can do it on their own. They believed that organic farming technology utilizes local resources and requires only minimal capital. Over the years, they experienced positive results in their 0.75 hectares or 7,500 square meters farm. 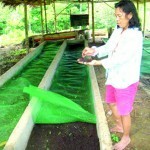 With their own initiatives, the farm was fully utilized planted with various crops and vegetables. Other farmers were inspired on farm production outputs and more farmers were interested in adopting organic farming. The farm turned out to be an area for learning where other farmers visit and see for themselves what they are doing. The couple now act as an adviser or consultant to other farmers wanting to adopt organic farming practices in their own farm. They are also involved in propagating different varieties of rice in the area.